The reason why we have edited through the other existing double battle guide is because it had a lot of errors and misinformation and could just use a whole tune-up. The reason why we left it there is because Dr. DoubleDuel is unaware of this one, and it would be rude to just completely replace his guide. Last edited by daveshan on Sat Apr 07, 2007 5:48 pm, edited 2 times in total. Last edited by tiger10x on Fri Apr 20, 2007 7:42 am, edited 1 time in total. Now, for the Hall of Fame. Last edited by daveshan on Sun Jan 14, 2007 3:01 pm, edited 4 times in total. Basically, Marowak keeps electric attacks off Gyarados, and Earthquakes them back. Gyarados surprises the physical wall that just switched in. Endureversaling might be harder in a Double battle, but Metagross can probably help. When Metagross uses Earthquake or Explosion, have Blaziken Endure. Then, sweep. Probably used best with Gengar to come out if Blaziken is KOed. Ok, I'll get on this after this weekend is over. I currently have a paper to write. his own Morning Sun for stick around a little bit. Ok, we are off to a good start. Saanaito, your marowak/gyrados combo did excellent all I had to do was change sword dance to protect, it worked better that way. With them in my lead spot, I won 4/5 matches. When they weren't my starting duo, I won 3/5 matches that they were involved in. The only problem with them is that it was either all (figuratively speaking) or nothing. The opponent either made a fatal mistake of not realizing marowak had lightening rod no matter how many times they used an electric attack, or they KO'd marowak first and then made quick work of gyrados. Either way, your pair qualifies and I'll notify tiger to give you some psybucks. The metagross/blaziken duo failed. Rarely would they be able to take out more than one other pokemon. As tiger10x mentioned in the guide portion, reversalers are just too hard to do in DB's without a Follow Me gaurd. Both of bushin's pairs failed to be any use. Salamence was better off with a CB and articuno rarely could pull off a sheer cold without my foe switching. The espeon and porygon2 duo was just too special sweeping. If my opponents brought out pokemon that were resistent to special attacks, they lost big time. Last edited by daveshan on Fri Oct 27, 2006 8:04 am, edited 1 time in total. Ok Im not sure how evs and dvs.and eal bellers and all that stuff works, but all i no is that this combo always works for me. Gyarados is resistant to cameruptsearthquake, and tat way they both have moves that cover alot of types, and with surf, rock slide, and eq, the two can give double damage to both opponents at the same time. I know that combo can't work for you, JPB. Because gyaradoses can't learn aerial ace. Come back when you have a moveset that can actually be done. Im postive it can. Im using that combo right now. In emerald it can. im positive. Well either my LG is faulty (I'm looking at it right now and it says I can't teach gyarados aerial ace) and psypoke's pokedex is faulty or you've got a glitched game or you sharked your game. If the psypoke pokedex says gyarados can't, I say it can't. If you want it changed, take a picture of your screen with the aerial ace TM selected and showing gyarados can learn it, show it to the Elite 4* and they'll change the site. Until then, I can't even rate it. P.S. Also show it to smoogan because I can't even test it if NB doesn't allow it. *scan the picture if you don't have a digital camera and if you don't have a scanner, go to your public library. 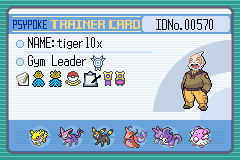 Toxic The Other,And DD,Then Protect & EarthQuake again,Overheat on eletrics And Hidro Pumps on Rocks that beat Gyarados,And ThunderBolt on Waters that kick Arcanine . I'll give these guys a try this weekend. I have tests on Thursday and Friday that I need to study for. I'm sorry I wasn't able to do the testing. I got piles of work and projects. I'll do them when I can. Sorry for the wait and the double post, but neither team proved that effective. With the two tanks, it was always too easy to get a pokemon out that would kill them before they could do what they needed to do. The dual intimidaters just had nothing special. Ok what i do us use cosmic power with lunatone and then i use a reflect by solrock. next turn i use cosmic power with lunatone again and then i finish it with an explosion by solrock so lunatone doesnt faint and solrock sweeps the rest of the dudes. Switch out if they have water types. Strategy: not much here. Medicham for snorlax, blissey, metagross, tyranitar, etc. 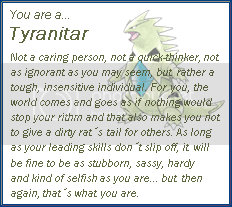 and gardevoir there to sleep them and just calm mind and finally attack. Strategy: use barrier with Mewtwo once. Calm mind with latios(one calm mind can practically sweep everyone) recover if needed. Mewtwo is there with the flamethrower and thunderbolt for pokemon that latios cant kill with ice beam. psychic for stab. Lots of new, good looking submissions. I'll try to get to these this weekend since I've got college work to do. I'll give this a go. Okay, this only works if Transform doesn't copy the stats of the opponent. If it does, then this is an awful moveset. Make Mew Transform into Smeargle. Recover away any damage that the opponent dealt to you. Then, using Sheer Cold (Horn Drill doesn't hit Ghosts, Fissure doesn't hit Levitaters/ flying types) and Lock on, sweep away. I put Surf in there for Pokemon such as Aggron and Steelix who might have sturdy, but they will usually have Rock Head for their Double Edge. You might want to switch Surf for Aerial Ace so that you have something to hit Shedinja with. Here's a new team I thought of. I'm bad at EV spreads, so hopefully you can think up of one. Last edited by Saanaito on Fri Nov 24, 2006 6:26 am, edited 1 time in total. Jeez, I feel really bad about how much work I have. I have had no time to test on NB. Please be patient. Typlosion starts with Sunny day then Tropias doesn't charge for Solar Beam. Typhlosion Earthquakes all electric types so Tropias doesn't get shocked. Typhlosion also slauters the ice types with flamethrower and sunny day is still there so flamethrower is pumped up. Tropias has x2 speed so it can go first and with solarbeam it slaters all of Typlosion's weakness. Gengar starts with Curse and Flygon uses Sunny day. While Gengar uses rest, Flygon uses Sunny day. Gengar wakes up using the chesto and uses Psychic and Flygon uses solar beam on the same target. THat SHOULD finish off one oppent. Next turn they use shadow ball and Flame thrower. THe turn after that Gengar uses pschic and FLygon uses EQ as a finisher. This is wha I use and it ALWAYS works!!!! (Defense against fire,and more accuracy for jirachi's thunder;And more speed and Sp.Att on kingdra's hidro pump). First fake out on the poke which can kill you,Gengar use sunny day. Next turn shiftry attack first(mostly) thanks to it's trait. take the rest with Boosted fire punch/Psychic or TB. PS*:Watch out for ghosts,Protectors and Metagrosses with agility. I hate to announce this. But, due to school work, I will be on a hiatus from testing the teams until around mid December at the latest. People may still post teams and I encourage them to do so. Just keep in mind it will take me a while to get to them. The first to get done will be mun2. A stabed focus punch with the add of CB, comming from a pokemon with 130 base atk stat is something not many pkmn will survive, specially when you are untouchable thanks to cleafable great HP and defences. This works much better if you have a second "follow me" pokemon in your team. Altough this strategy is very predictable and if the foe uses a fighting move on cleafable her tanking abilities are very reduced. The idea of this set is to lower the opponents attack by two (intimidate) and then, use EQ over and over without harming your allies. If you don't use the CHoice Band, power up with Dragon Dance, but personally, I would rather use the Choice Band for power. The Hyper Beam for Gyarados is for when you're about to get knocked out; Salac gives you a boost, then you can get that Hyper Beam out pretty nippish, getting a good amount of damage on the opponents. Hydro Pump for Salamence would be a great suprise if you don't go with CB. I mean, supposing they send out a Claydol, you suprise them with Hydr Pump. It will be a great shock to them!